I thought I'd collect all audio examples of the Solaris keyboard in this one area. What I'd like to start with are much simpler sounds, and I've done 3 quick examples to show some very specific things. No effects were used, it's just a direct feed from the stereo analogue outputs. This is an extremely simple patch, made up of 2 oscillators, no filters, 2 envelopes, and 2 LFOs. Osc 1's amplitude is being modulated by Osc 2, whose output is shaped by an envelope. (The 2nd env is the Amp EG, of course). Since you can modulate each input of a mixer, I have a mixer with Osc 1 coming into 2 of the 4 inputs. The first input is getting modulated by Osc 2, and the second input is modulated by an LFO. Another LFO controls panning. This just because it's an old favorite of mine from my Prophet 5 days. 2 oscillators feeding the ladder-type Lowpass 24 dB filter, with medium resonance. The filter cutoff is modulated by 2 LFOs, one of which is tracking the keyboard, while the other a very slow sweep. A third input provides an envelope to the cutoff. Again a bit of Pan modulation by another LFO. Again, another very simple sound, using 2 oscs (sine waves), one with a slight bit of pitch EG (and no filter). The point here is to show how nicely audio rate modulation of the Pan position works - something you won't find on your typical synthesizer. As I hold down the F major chord a few bars in, I start to adjust the Coarse tuning of Osc 4, which is modulating the Pan. At first it's at -60 semitones (sub-audio range), and then I gradually (more or less!) raise it all the way up to +60 semitones. At the end, I again grab Osc 4's Coarse frequency and quickly drop it all the way back down while holding a higher chord. Last edited by John Bowen on Mon Jun 16, 2008 10:33 pm, edited 1 time in total. That should wake up the dead. What conversion app do you use for the files? Mine sound like crap when I convert them as a batch file to mp3. But then again mp3's sound like crap to me when synths are beiong used anyway. All of the lows and highs they claim that aren't noticed that are sacrificed sure get noticed by me. These are not converted - they are all still .wav files. It's just that the folder they are in is named MP3....probably should change that. The PanMod is way cool. I hear the polyglide coming in strong also. Do you record the notes first, then overdub with controllers? John and Goffe were over at my studio doing side by side comparisons with a Prophet-5 rev1 to see how the SSM filter performed in the Solaris. I was really impressed with how well matched it was over all. You may know that the SSM filter in the rev1/rev2 is what makes a Prophet-5 for most people. I had the privilege of being able to borrow the Solaris prototype for about 18 hours. Unfortunately I could only sit down and use it for about 6 hours and I came up with a little tune which uses a few patches John asked me to write to locations 2 and 7. They use the SSM filter as well as that really great 'Comb Filter: Tube' which you'll hear as a Flanger effect. The pad is made up of four oscillators with 2 LFOs detuning them. I used the MOD wheel to modulate the mixer and had the oscillators in pairs so I could bring them in and out using the wheel. Sort of like the Y axis of a joystick or touch pad (I *really* like the idea of having mod paths to the mixer) The drums were done with a TR-606. Thank you for posting the mp3 sjones, that was sweet and it was nice to hear Solaris in a song environment. 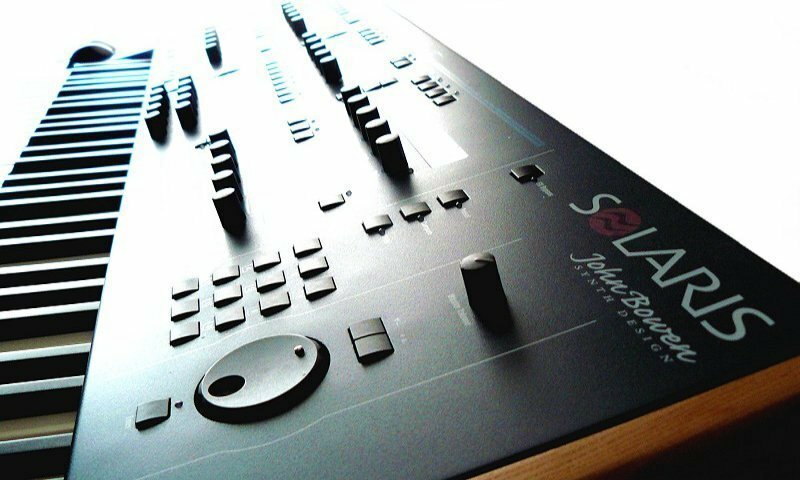 Using a fat bass and non intrusive drum kit sound, gives Solaris it's own range for frequency, and the sounds you combined are excellent. I heard the PolyGlide features used on 1 pair of Oscillators which allows the other pair to continue their paths unaffected. Nice. I wish to join a group of sick preset makers after the synth is released. I am sure you and Brotha' Man Howard will be at it's Pinnacle, as well as the entity known as Bowen and others as well. Nice demo. made me run to my Solaris and create a similar patch using the Sample Ocsillators, PolyGlide and the SSM. I have done a similar hardware A/B test with my Oberheims and a buddy's ancient rack mounted MiniMoog, against the " Mini : filter which I assumed was the emulation of a stepped Moog ( Mini has never been misleading to me ) and found it to be very good. I am using older DSP's too. The hardware w/ the newer Analog Device choices might or might not sound better, either way I will have both versions chained together live. We need more demos to calm our fever. Thanks Again Brotha' Man RedMartian. "Nord Stage plays the plucky soft/metallic sound and a little bit of acoustic piano. All other sounds are courtesy of the Solaris prototype I had in the studio for a couple of days...beautiful instrument." "All synth sounds were programmed and played on a prototype of the John Bowen Solaris, a unique and beautiful synth. The timbres in this song are mostly PPG-style wavetable patches as well as a 'multi-saw' string pad and a VA sync-sweep lead. Drums are Korg Electribe ES-1." Thanks for posting it JB. I really like the Permanent Sun mp3. Makes me want to go makes some sync and comb stuff. Thanks John for linking the tunes I did with the Solaris prototype! I just wanted to add that on both occasions I only had limited time with the Solaris so the patches arent as "perfect" as I would have liked...this is more a problem of my lack of time with the instrument rather than with any limitations of the instrument itself. I barely scratched the surface. Once I can dig into the real deal for an extended time period, the tunes will be pure magic! FWIW, the last time I heard the prototype, I was completely fooled by the SSM filter - someone was playing some juicy analog chords and I thought one of the vintage synths in the studio was patched in to the mixer and I yelled "What synth is that?! Sounds great!!!" - it was the Solaris!!! The Solaris can do "digital" in spades but I'm thrilled that the analog emulation will be this wonderful!